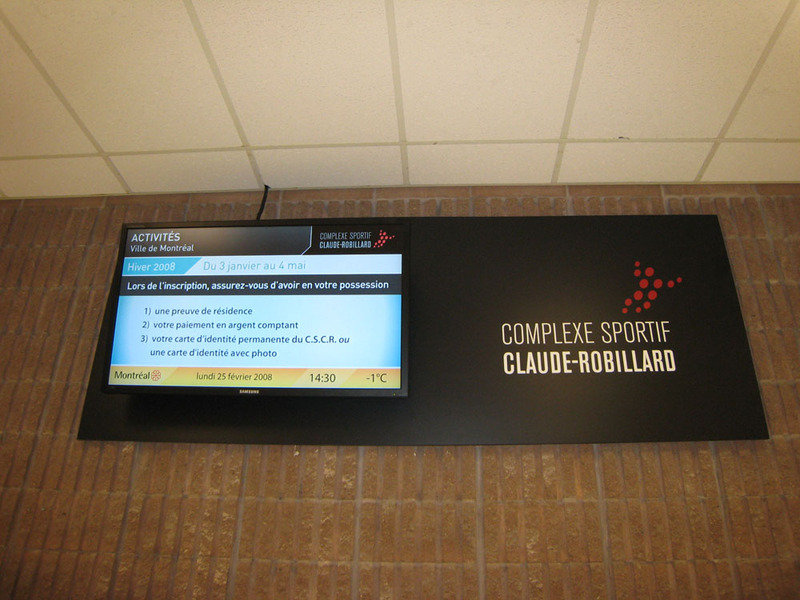 Using Mirada Media’s ChannelView digital signage solution the Complexe Sportif Claude-Robillard integrates dynamic messaging with its signage to inform and educate its members, visitors and staff. Montréal, July 30th 2008 – In an effort to modernize its signage and increase the effectiveness of its communications, the Complexe Sportif Claude-Robillard, a world-class sports facility run by the City of Montréal, called upon Mirada Media to provide a complete digital signage solution including hardware, project management and support that would act as an integral part of their extensive signage modernization project. 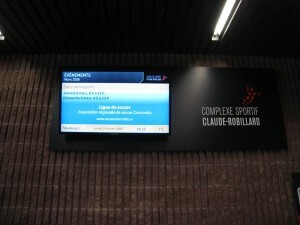 Complexe Sportif Claude-Robillard was looking for an effective and modern way to disseminate information on the facility opening hours, activity subscription, important dates, news, and to promote the many provincial, national and international sporting and athletic events they host weekly. “We wanted to make our signage more dynamic and more attractive for our clients and employees,” says Réal Travers, Division chief for the management of installations at Complexe Sportif Claude-Robillard. To achieve this, six commercial-grade high-definition Samsung 46” LCD’s were installed in high-traffic areas on four floors of the complexe’s main building, powered by a Mirada Media ChannelView media appliance and a video-over-CAT6 distribution system. The screens and hardware can be fully remote controlled from Mirada Media offices without the need for staff intervention. “The screens are installed in strategic areas throughout the Complexe Sportif Claude-Robillard that facilitate a uniform distribution of information practically in real-time!” explains Mr. Travers of the new digital signage system. The “real-time” aspect is one of the main benefits of digital signage. It is achieved by a service contract that provides on-going scheduling and design support as well as a custom content management system designed by Mirada Media’s programming team. City employees can access the latter from their desktop browsers to easily make changes to visual templates. In addition, Mirada Media monitors the health of their network and can diagnose and resolve issues remotely via the ChannelView Player software that is loaded on Claude-Robillard’s media appliance. The software also allows Mirada Media to distribute content to Claude Robillard’s digital signage network remotely on demand. “Among other advantages, the screens allow us to offer complementary information, such as the time, weather, bus schedules and eventually we’ll use them for advertising,” says Mr. Travers. “Since we’ve installed the screens the comments have been positive and unanimous and our users seem to really appreciate the information we’re providing them,” adds Mr. Travers. Mirada Media’s ChannelView Solution provides many templates and plugins to display live information sources (news, weather, etc. from RSS feeds) that are updated instantaneously to complement the main content. “It’s these little extras that keep your audience coming back for more,” says Eric Morello, Director of Marketing at Mirada Media, Inc.
“When people are asked about digital signage they more often than not think about out-of-home advertising, in-store TV or other commercial applications, but it has uses in the public sector as a powerful communications tool”, explains Mr. Morello. “As an integrator, our goal is to find the digital signage solution that meets the client’s specfic needs and goals, whether it’s for a shoe store, museum or corporate office,” concluded Mr. Morello.